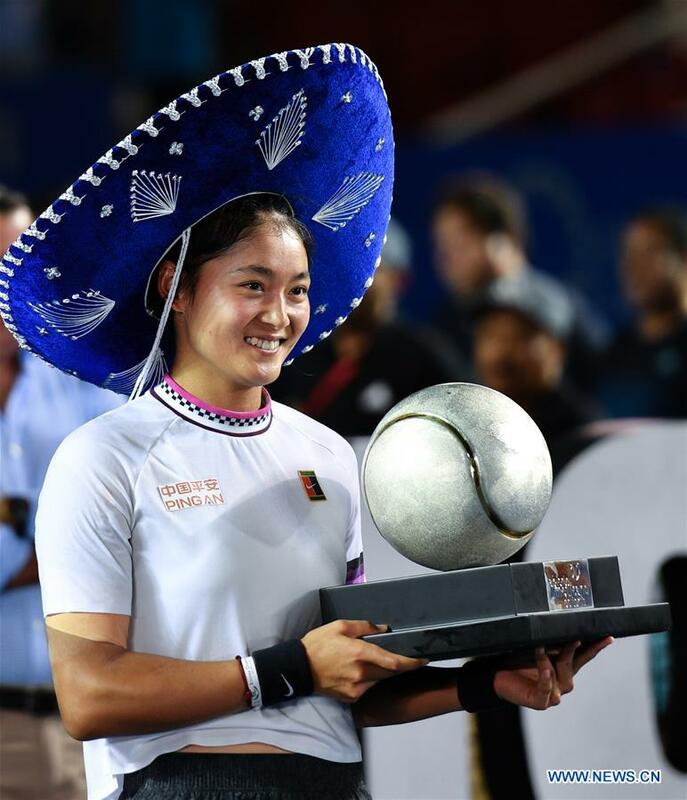 China's Wang Yafan poses with the trophy after beating Sofia Kenin of the United States 2-6, 6-3, 7-5 in the women's final of the Mexico Open in Acapulco, Guerrero state, on Saturday. Australian Nick Kyrgios capped a scintillating run at the Mexico Open in Acapulco with a 6-3, 6-4 victory over world No. 3 Alexander Zverev on Saturday to claim his first ATP title in more than a year. Kyrgios defeated three top-10 players on the way to the title, saving three match points in a second-round victory over second-ranked Rafael Nadal — owner of 17 Grand Slam titles — and beating No. 9 John Isner in the semis. He also beat three-time Grand Slam winner Stan Wawrinka in the quarterfinals of a drama-filled week that saw him shake off hostile crowds, illness, injuries and moments of malaise — not to mention a post-match scolding from Nadal. His win over Zverev was a remarkably straightforward affair. "I just chucked in a lot of drop shots, tried to keep him guessing, that's all you can do," said Kyrgios, a former world No. 13 who has slipped to 72nd in the world. "He's super-fit, so he's going to grind you down so I tried to keep the points short when I could," added Kyrgios, who spent more than nine hours on court over his four prior matches but needed just an hour and a half to dispatch Zverev to claim his fifth ATP title. "You know, I lack on the physical side a little bit," Kyrgios admitted with a smile. "But today I served well and just played the clutch points pretty well." Indeed it was Zverev whose nerves were frayed after Kyrgios broke him at love in the fourth game of the opening set then held for a 4-1 lead, prompting the German to smash his racquet in frustration. Kyrgios broke again to open the second set, but double-faulted on break point in the next game. He broke Zverev again in the fifth game and held with confidence the rest of the way to capture his first title since Brisbane in January of 2018. While Kyrgios had come to embrace the role of tournament villain in which pro-Nadal fans had cast him, Zverev said fans should appreciate what they had seen from him. "Really, he's the one who deserves to win it," Zverev said. "He's the real champion this week," and the fans, finally won over, cheered. In women's action, China's Wang Yafan rallied from a set and a break down to capture her first WTA title, defeating American Sofia Kenin 2-6, 6-3, 7-5. World No. 65 Wang, playing in her first WTA singles final, outlasted the 35th-ranked American to claim her breakthrough title after two hours and 10 minutes. The 24-year-old from Nanjing seized a 2-1 lead in the final set by taking advantage of her third break-point chance in the game. Wang held on her first ace of the match for a 3-1 lead, but surrendered a break on her fourth double fault to allow Kenin to equalize at 3-3. After Wang held at love to 5-5, she reeled off the last four points of the 11th game to break Kenin and then held serve for the triumph. The 20-year-old American was denied her second career WTA title and second crown of the year after taking her first at Hobart, Australia, in January. There was more good news for China as Zheng Saisai teamed up with Victoria Azarenka to win the women's doubles crown. Azarenka, of Belarus, won a title for the first time since giving birth to son Leo in December 2016, as she and Zheng beat third-seeded Guiiana Olmos and Desirae Krawczyk 6-1, 6-2.